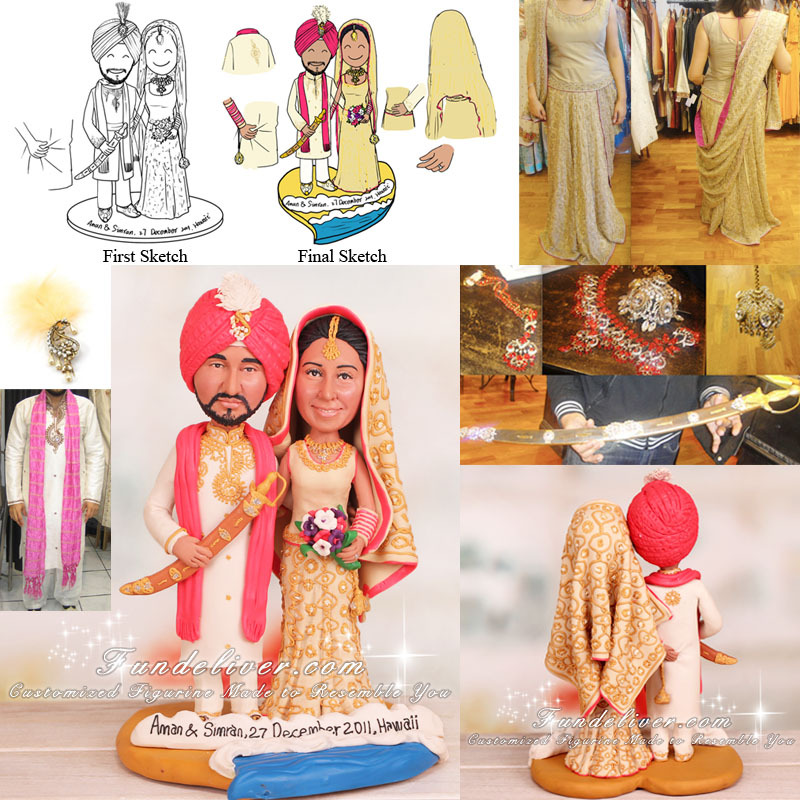 Home :: Wedding Cake Toppers :: Ethnic Wedding Toppers :: Indian Cake Topper with Tikka, Bangles, Kaleeray, Duputta, Kirpan etc. 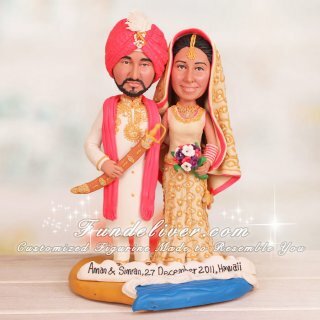 This is a completely customized Indian wedding cake topper ordered by one of our customers. This design is based on our past work ”Hindu or Bollywood, Indian Theme Wedding Cake Toppers and Decorations”, but make some adjustments. For the groom’s turban, they would like to do the same style turban as our sample cake topper. The only difference is the color. It is a fuchsia pink that matches the pink lining the bride's outfit. The kalgi (decorative piece on the turban with the feather) has gold and clear crystal in it, ivory color for the feather. The groom is holding a kirpan (ceremonial sword) which is with wooden case with crystals and gold touches. A pink scarf (same color as the turban) is added, draping around the neck. For the bride, they would like her to be wearing traditional Indian outfits, which color is antique gold, the embroidery is gold, and the piping is fuchsia pink. The skirt is touching the floor (so can't see shoes) and finished off the pink lining as shown on above image. The top is a round neck. The duputta (veil/scarf) is placed over the head and covers the back of the top. The embroidery on the duputta is all over and exactly the same as the skirt (except for the border as different style embroidery). For the Jewelry, they would like the bride to be wearing a tikka (jewelry for the forehead), a necklace, earrings, bangles, "kaleeray" (dome like shape that hangs off a chain that is tied to the end bangle closest to the hand), and diamond engagement ring.